As a homeowner, you only want to make additions to your home that will increase its energy efficiency and provide a return on your investment. One of the simpler changes that you can make is installing storm doors Pittsburgh to the exterior of your home. With a relatively low up-front cost, installing a storm door is a generally inexpensive option that can provide homeowners with a number of benefits. 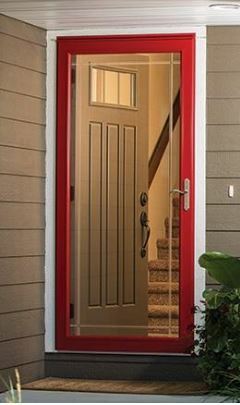 Storm doors are typically made out of either aluminum, fiberglass, or wood. As an added feature, many are equipped with interchangeable glass and screen inserts. When a storm door is newly installed, it can be expected to last anywhere from 25 to 50 years, depending on the material it is made out of and the quality. Here are four ways a storm door can enhance your home. For most homes, the exterior door is more expensive than a storm door. This is because most exterior doors have special stains or paints on them and include decorative glass. These doors can benefit from having additional protection against the elements and wind-blown debris. Storm doors provide extra protection, ultimately saving homeowners money on maintenance costs and prolonging the life of the exterior door. Even though you might have an energy-efficient exterior door on your home, adding a storm door will provide your home with an additional layer of protection and energy efficiency. This added layer of protection places an extra buffer between you and the summer heat or winter cold. Storm doors that are equipped with low-emissivity glass, known as Low-E, can cost an additional 15 percent up front. This additional up-front cost can result in reduced energy loss by up to 50 percent. However, the U.S. Department of Energy doesn’t recommend a storm door with glass, if your exterior door receives several hours of direct sunlight throughout the day. This is discouraged because the glass can trap heat between the storm door and the exterior door, resulting in damage to the entry door. Storm doors provide a barrier, keeping what lurks outside from getting inside your home. On days when you want to let in a breeze from outside, you can safely and confidently open your exterior door to get a breath of fresh air without letting outside bugs and insects enter your home. A good way to discourage burglars from entering your home is to place an additional barrier between them and your precious belongings inside. Adding a storm door between you and those unlawfully attempting to enter your home can provide you with an added sense of security. If you live in an HOA neighborhood or condo, be sure to find out what rules they have concerning storm doors Pittsburgh. Some neighborhoods require approval before you can have a storm door installed. Once you have the approval and the door picked out, Thomas V. Giel Garage Doors can professionally install your new storm door.